Sitting here at work, I just opened the monthly calendar. I need to schedule a couple of personal appointments and wanted to check my availability. Wow. As I look over the boxes on the page, I am amazed with all of the glorious, wide-open, spaces. It wasn’t too long ago that our calendar was filled with places to go, people to see and things to do. Life was all about schedules. When we became empty nesters and made various cuts, we couldn’t help but bask in the glory of our freedom. It was wonderful to be able to come home from work and not have to be anywhere at all. Oh, and to have a free weekend? Heaven on earth! That is not the sound of us sleeping, but the sound of us zoning out! We are wide awake, but I think in some way our brains are very clearly making that sound. Ummm…this sort of concerns me as I picture the two of us sitting there together, but zoned out in our own little worlds. So, I think it might be time to re-think how I’m using all of these wide open boxes. Maybe I could turn off the TV, resist the urge to get cozy in that little corner of the couch, put down the device from time-to-time, and return to some old-fashioned ways of doing things. …read a good “fiction book.” I am always reading something but most of the time it’s self-guidance or tutorial related. How heavenly it sounds to hold a book in my hands that takes me to another city, another place in time, where I’ll meet new people. …talk on the phone (gasp!) every now and then, so the friend or family member, on the other side of the computer screen, gets their true voice back. I used to be such a telephone talker, but modern technology and schedules made me feel like I didn’t have time for small chit-chat. …actually invite family and friends over to just sit for a spell. With all of the fancy Pinterest ideas (which I do love), it seems every gathering now needs to be filled with entertainment for all of the senses. Can’t sitting, relaxing and chatting over a nice beverage be enough? Yes. I believe it can. …push the stack of mail aside, turn on some good tunes and light a couple of candles at the dinner table, to turn our Chipotle Burrito Bowl meal into something relaxed and romantic. …just an intentional focus on Zoning In. The possibilities are endless. Today I had to step outside the office to go to another building. As I walked along, I breathed in the fresh air and really opened my eyes to all that surrounded me. Wow…it’s a gorgeous day! 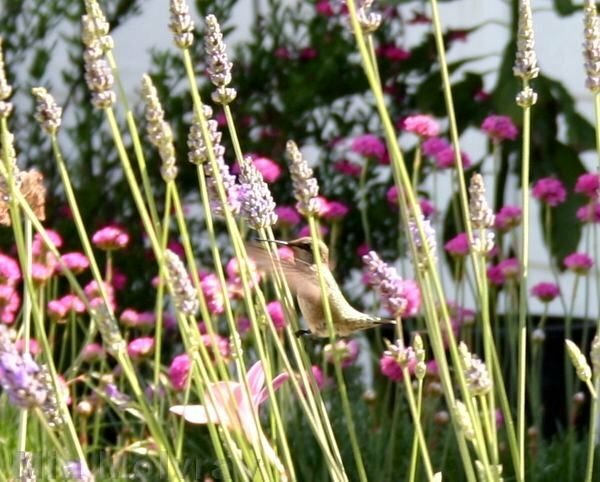 And I actually saw three little humming birds in three different places. They didn’t even seem to mind that I was so close to them. I love hummingbirds. But…I was amazed and a little bit saddened by this. When did I stop taking breaks from my work? There’s a reason they give us breaks from our work. Friends, there’s a world out there that we’re supposed to be living in. The place you work, the home you live in, the family you have, the friends in your life…we’ve been strategically placed. What simple changes can you make to embrace and be active in your life? Here’s to finding a happy and healthy balance. Here’s to opening the eyes of our heart and embracing our relationships. Here’s to Zoning In and enjoying the life we’ve been given. This entry was posted in The Journey and tagged balance, family, friends, health, home, life, marriage. Bookmark the permalink.